Webster’s defines “Wisdom” as “accumulated philosophic or scientific learning; knowledge.” Good sense and judgment are also mentioned. So you want your landscape design to become more Water-Wise. When it comes to saving water, science certainly does apply and common sense doesn’t hurt either. From a very simple standpoint common sense dictates not watering during the hottest time of the day. Just yesterday I saw lawn being irrigated at 3:00 in the afternoon. Setting the timers of your irrigation clocks to come on early morning is optimal. If you are using spray irrigation (at least use MP rotators that water more efficiently) there is less breeze early morning, so less water is carried off to your neighbor’s yard. Watering at this time also allows the water on the plant’s leaves to evaporate once the day heats up and not cause fungus to develop. Of course other common sense applications are to repair any broken sprinkler heads, you can’t compete with Bellagio’s fountains in Vegas anyway. 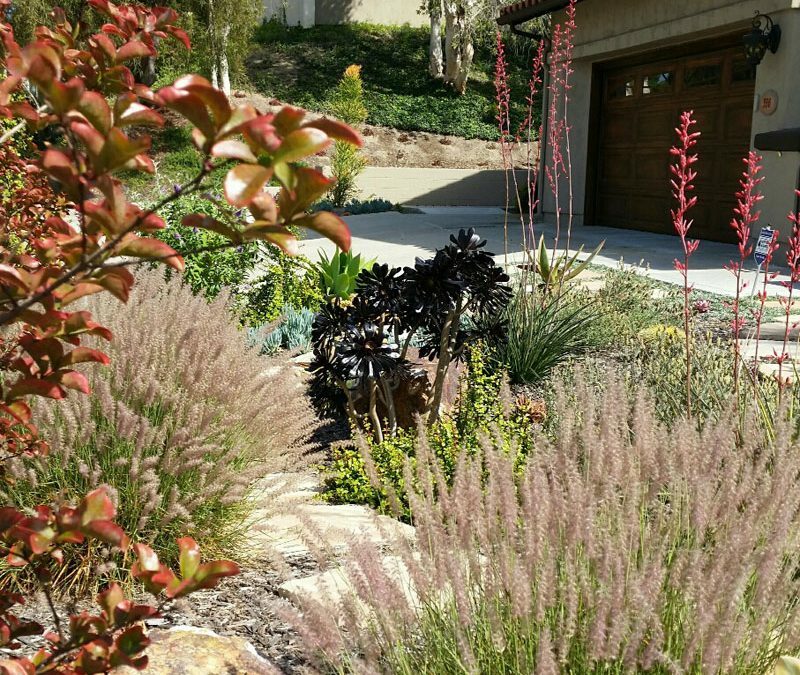 Once you’ve committed to a water-wise landscape design and do a Xeriscape theme, you can convert your former lawn sprinklers to drip without too much expense. So you don’t have to re-invent the wheel when it comes to being smart about watering. Other common sense factors include planting less plants. Leave space between plants. Less plants equals less water. Again, use California native plants. They’ll need water on a regular basis for the first 18 months, then you’ll reap the rewards with lower water bills as you cut back to once or twice per month. Other simple rules to follow include building the small mounded berm around each plant, so as it does receive water, none of it flows away from the plant. And I’ll repeat again, mulch, mulch, mulch. A 3 inch layer is what you really need and it rarely happens. Mulch does have to be replaced in some quantity every year. We are fortunate in San Diego as mulch is free from Miramar Landfill. All our recycled green waste is turned into mulch for homeowner’s use. Borrow a friend’s pickup truck and fill up the bed. Drip irrigation conserves the most water as little if any is wasted with evaporation. Spray will never compete with water savings. And, despite our recent lack of rainfall, adding a Smart Irrigation Controller makes good sense as it will adjust the cycle when moisture is present. Don’t you hate to see irrigation spraying groundcovers on the sides of our freeways when it is raining? I know I do. Adding more trees to our landscape also makes good common sense. Shade cools the earth and the plants below the tree’s canopy. Adding trees to cool your home is a wise choice too. Why use air conditioning if you don’t have to? And deciduous trees after shedding their leaves allow more sun to warm your home in the winter months, that is if we have any cold weather. From a scientific standpoint, you can now find moisture controlled soils for potted plants at garden centers. Improving our poor soils with more organic matter or compost will allow the soil to hold more water longer. The entire aspect of soils science is far too complex to explain at this time. But doing a soils test is a great suggestion to see what nutrients your soil lacks and what the basic composition is. Southern California is famous for its heavy clay soil filled with cobbles which make planting a true challenge. Plants in general, will suffer with either too much or too little water. Sometimes a homeowner will kill a plant with kindness, most people can’t recognize the difference between wilting or drowning. When in doubt the best rule of thumb is to stir up the soil with your fingers and see if you can feel moisture. And keep in mind a slow trickle of water is desirable as it encourages roots to go deeper. Deeper roots make for happier, sturdier plants and less dependent on irrigation. So think before you water. Think about water as a finite resource. Think about water and its life giving qualities. We can’t go on abusing our water resources. Some of us will take a “military” shower to balance more water in the yard. Are you a water hog or a water savior? It’s your decision to develop a water-wise landscape design and do your part to manage our limited resources. Contact Letz Design for more ideas on how to save water in your landscape.